The following is a list of sporting venues, events, and teams based in Alaska. An Aces game at "The Sully"
Chugach State Park, a 495,000-acre (2,000 km2) high alpine park. Anchorage has a large number of groomed cross-country skiing trails within the urban core. There are 105 miles (169 km) of maintained ski trails in the city, some of which reach downtown. 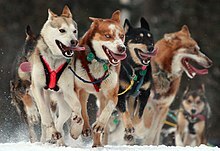 The Tour of Anchorage is an annual 50-kilometer (31 mi) ski race within the city. ^ Guide to the State Parks of the United States-2nd Edition. Washington, D.C.: The National Geographic Society. 2004. pp. 340–342. ISBN 0-7922-6628-5. ^ "Trails". Parks and Recreation. Municipality of Anchorage. Retrieved 26 February 2014. ^ "Tony Knowles Coastal Trail". Alaska Trails. State of Alaska. Retrieved 26 February 2014. ^ "Great Alaska Shootout". Anchorage: 100 years of big wild life. Anchorage Convention and Visitors Bureau. Retrieved 25 February 2014. ^ Pedeferri, Tony (18 October 2012). "Alaska Race will Return in 2013". US Handcycling – News. Retrieved 25 February 2014. ^ "Tour of Anchorage". Anchorage: 100 years of big wild life. Anchorage Convention and Visitors Bureau. Retrieved 25 February 2014. This page was last edited on 9 April 2019, at 07:00 (UTC).